A little while ago SpaceX Dragon spacecraft blasted off atop a Falcon 9 rocket from Cape Canaveral in its CRS-10 (Cargo Resupply Service 10) mission, also referred to as SPX-10. After almost ten minutes it separated successfully from the rocket’s last stage and went en route. This is the tenth mission for the Dragon spacecraft to resupply the International Space Station with various cargoes and then return to Earth, again with various cargoes. The CRS-10 mission marks the return of SpaceX to flights after the explosion of a Falcon 9 rocket on the launch pad during the preparations for the launch of a satellite. The investigation showed that the oxygen could have become so cold to solidify and, under pressure, to trigger an explosive combustion with the carbon compounds with which it was in contact. This launch also represents the debut of SpaceX in its use of Cape Canaveral’s pad 39A, one of those used by NASA for some Apollo and space shuttle launches. SpaceX leased the pad for 20 years, modifying it for the launches of its Falcon 9 rocket and in anticipation of future launches of its Falcon Heavy rocket. The Dragon spacecraft’s cargo is of almost exactly 2.5 tons (almost 5,500 lbs) between the pressurized and the non-pressurized section. There are about 300 kg (650 lbs) of food and other supplies for the International Space Station crew but most of the cargo consists of instruments, hardware and various other materials needed to science experiments and research conducted aboard the Station. The two most massive experiments transported to the International Space Station are the Stratospheric Aerosol and Gas Experiment (SAGE) III and the Lightning Imaging Sensor (LIS STP-H5). They make up almost a ton of weight and occupy the Dragon spacecraft’s non-pressurized section. The SAGE III experiment is part of the longest NASA’s Earth observation program. Started in 1979, it serves to continuously collect data that help scientists understand the Earth’s atmosphere by measuring its stratosphere ozone, aerosols and other gas traces. The STP-H5 LIS experiment has the purpose of measuring the amount, rate and energy of the lightning that strike around the world. According to existing instruments, on Earth there are 45 lightning strikes per second, this new instrument will collect information from the International Space Station to help improve climate models and weather forecasts. 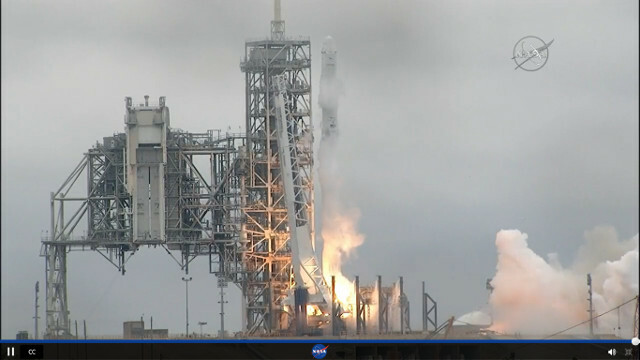 The Dragon spacecraft is now en route to the International Space Station and everything proceeds normally. The arrival of the Station is scheduled for Wednesday: at 11 AM UTC the Dragon will be captured by the Station’s robotic arm. Meanwhile, the Falcon 9 rocket’s first stage successfully landed at Cape Canaveral.